Allow yourself to be enchanted by this magnificent residence full of old world details hand in hand with modern contemporary design, by renowned chilean architect Cristian de Grotte. Stone covered walls and rustic tiled walkways bordering a stunning landscaped garden lead visitors to a beautiful glass entrance door and inside a luminous foyer, where hardwood floors and wood paneled ceilings welcome you with open arms. The formal living room is flanked on two sides by huge windows providing amazing views of the grounds as well as allowing sunlight to stream inside, of to one side adyacent to the living room, a wood paneled bar area contributes to the house's old world atmosphere. A roofed terrace allows you to enjoy outdoor entertaining year round. An expansive formal dinning room with vaulted ceilings which exits unto a rustic tiled orangerie affords its owners a different alternative for entertaining. Possibly one of the most amazing details is a 17th century door, which the owners rescued from a chapel and used as the entrance to the master suite. Located on the houses main level this suite features vaulted ceilings, a comfortable sitting area as well as dressing room and modern bathroom with whirlpool tub and glass enclosed shower. Moving on to the houses lower level visitors encounter a movie room, grand family room and two childrens suites all with fabulous views of the garden beyond. 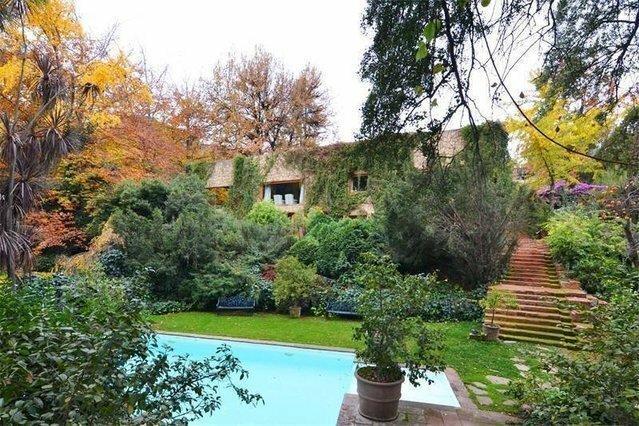 This property also has a guest house of 100 square meters.Take your time to explore the grounds, designed by Alberto San Fuente, one of Santiago's premier garden landscape architects. This 6,000 sq meter eden amazes us at every turn, whether you choose to relax by the fire pit, take a stroll through its winding pathways or sit down to admire the antique water fountain you will need to prepare yourself to return time and again to discover the full extent of this magical estate.